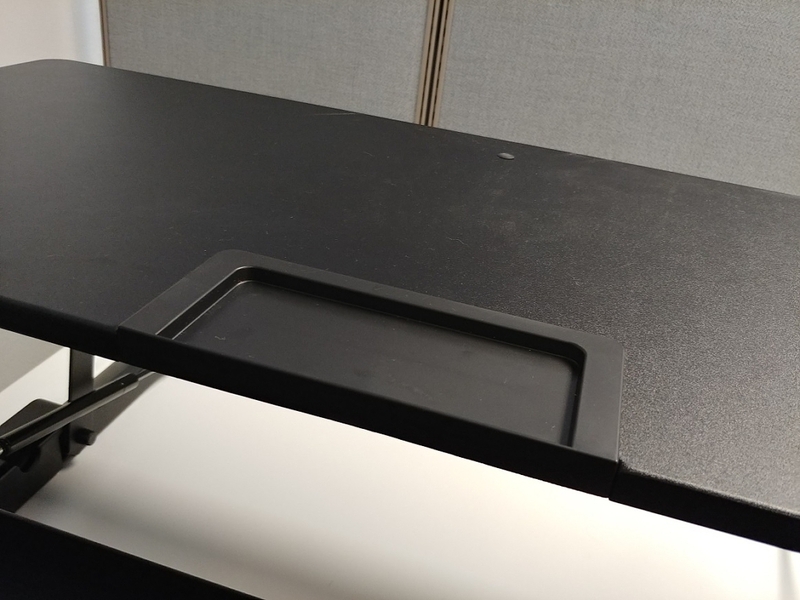 Vivo’s manual standing desk converter is yet another affordable option in a sea of competitors attempting to undercut the Varidesk and the Ziplift. While it lacks an ergonomically tilting keyboard tray, it promises many of the other key features buyers would want in a converter. Its low cost, however, comes from the use of several cheap components, as well as design decisions that render the product difficult to use. Affordability is its main selling feature. The finish does not feel cheap, and the worksurface is generously sized. Its overall heaviness makes it feel like it won’t break easily, and its air piston counterbalance, while not particularly powerful, did work as advertised. Very difficult to adjust height, especially for shorter users. Assembly was quite difficult. The strange “pen tray” on the main work surface just gets in the way. Height settings do not lock in easily due to poor machining standards. Converter is imbalanced and heavy in the front, leading to instability. If you’re short or if you have back trouble, this is not the converter for you. The handles are located pretty far back from the front of the work surface, meaning you’ll have to lean over it to get any leverage and adjust the height. The heaviness of the converter, in combination with its weak counterbalance, make it a chore to lift or lower. Combined with a slew of other strange aspects, the Vivo isn’t quite ready for mainstream adoption. 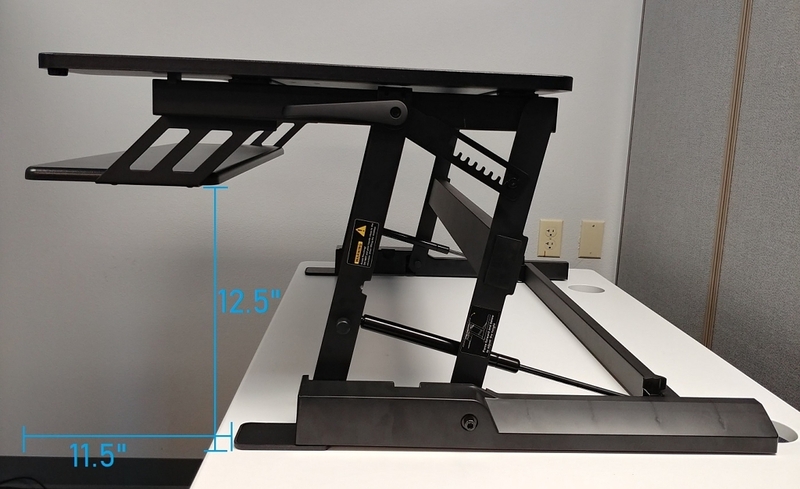 The Vivo standing desk converter caught our attention with its exceptionally low price point of $180 (for the manual version). As always with popular, low-costed products, we approach with a healthy mix of skepticism and hope. What costs were cut in order to arrive at such a price, and were those cuts reasonable? Sure, the keyboard tray does not feature ergonomic tilt, and its max height of 16” will not be suitable for taller users, but these are concessions that many are willing to make to save a couple hundred dollars. While we stress the importance of ergonomics for better long term health, increased affordability means an even wider percentage of people will have the option to work while standing, which is a good thing. Affordable shouldn’t have to mean bad. But it’s always the unforeseen problems that we find—the ones that are impossible to predict by looking at an Amazon product page—that keep these low cost products from competing with the big boys. Lack of tilt and difficult assembly we can deal with; compromised basic functionality we cannot. While the Vivo isn’t unusably bad, it’s not the right product for the majority of buyers. Vivo’s manual riser has a durable finish that doesn’t feel cheap. It may only be available in solid white or black, but it has a nicer look and feel to it than, say, the HPL of similarly priced competitors. The product also feels generally pretty well put together. It is heavy and has a certain degree of sturdiness (more on that later.) The work surface is wide and accommodating, allowing you to use two monitors as long as you can stay under the 33 lb weight limit. It even includes modest cable management supplies to help keep your work space neat. The Vivo's handles push down against your hand as you lower the converter. Let’s start with the Vivo’s handles. While they weren’t the absolute worst we’ve ever seen, they are definitely a little quirky. They’re located far back from the front of the work surface, meaning that, unless you’re on the taller side, you’ll have to lean over the converter in order to push it down. This will put a lot of strain on your back. The handles also have the very strange property of pushing down, or expanding, as the converter is lowered. You’re supposed to lift the handles up to unlock the converter, but as you lower the height, the handles push back against your hands in a downwards arc. This not only feels really bizarre, but also puts strain on your hands. The counterbalance on this converter is weak, and combined with a heavy frame, it quickly becomes difficult to lift as you load it up with monitors and accessories. This is somewhat expected with a super-cheap converter, but it just makes it tough to use on a day-to-day basis. Once you pass the 20 pound mark, height adjustments become exceptionally difficult. Compounding the issue are the poorly constructed “teeth” that are supposed to lock the converter into one of (only) eight preset height levels. The teeth don’t lock in 100% of the time, meaning that your work surface, and everything on it, may unexpectedly shift down a centimeter or so. And if that’s not enough to deter you, it makes a loud clanging noise when locking into place, which your coworkers will quickly grow tired of. The front of the keyboard tray extends 11.5" past the feet, creating a potential tipping hazard. This can be mitigated by putting weight at the back of the work surface. When the Vivo manual converter is extended to its full height setting, tipping over due to imbalance can be a serious issue. Because the keyboard tray extends so far out towards the user, the converter is very front-heavy. We suspect this is the reason for the add-on foot pads, which add a tiny bit of extra leverage to the base. This problem will be less of an issue the more weight you put towards the back of the main work surface—but as we pointed out, that makes lifting the work surface more difficult. There are a few other problems with this product. More bars on the frame mean more potential pinch points for your hands. A crossbar below the worksurface means that you can’t use any old monitor arm, you need to use one that will fit underneath (Vivo offers their own compatible option.) And finally, the “pen tray” is nothing short of baffling. It’s located right at the front of the main work surface, where you might want to put your laptop. It’s not mounted flush with the tray, so that means that your laptop will be resting on an uneven surface. Of course, it’s not removable. It’s just stuck there, in the center of your work surface, serving little purpose but to annoy. The kicker is that at 6.5” long, it’s too short to fit a standard #2 pencil. The assembly left us never wanting to use an Allen key again, since it requires you to tighten screws directly below an overhanging panel, meaning you can’t use full rotations of the Allen key. Once our (all-too experienced) assembly expert had finished attaching the keyboard tray, it promptly fell off as soon as we applied any weight. The lesson here is to make sure you’ve secured the tray properly before trusting it with your keyboard. The other issue with the set-up process is that the Vivo is just incredibly heavy. The box informs you that it’s a two-person lift. It’s a large, unwieldy product and it weighs around 54 lbs. If you’re planning on going it alone, good luck. When we started digging around in Amazon reviews, we saw a high amount of people complaining about the keyboard tray falling off, but we were surprised to learn that our version had been redesigned to address this specific issue (which it obviously did not). The keyboard tray must have been even worse in the previous version. It may sound like we’re being harsh on the Vivo, but we want to be clear that every issue we described here will be one that you’ll have to contend with as you use this product day in and day out. You can save some money now, but will it really be worth it in the long run if you hurt your back trying to lift the thing? That being said, despite its problems, the Vivo is definitely still better than nothing, provided that you’re in the sweet spot of being tall enough to easily adjust the height of the converter, but not too tall to make use of its 16” height adjustment. If your budget won’t allow you to get a proper standing desk converter, there are worse options out there than the Vivo. This unit is also sold as the generically-named BOTD 36.25" Wide Standing Desk Converter for $199. For more reviews like this, check our our Standing Desk Converter Comparison Review. 3) I have not felt like the Vivo was a tipping hazard (27″ iMac on surface) certainly no more than the Varidesk I use at work. Overall no tipping concern. 4) My one complaint is the effort required to raise and lower for the Vivo is more than the Varidesk unit I have at work. 5) No clicking or issues locking the Vivo into whatever height I need – maybe this was corrected too? Overall, at basically 1/2 the price of a Varidesk you get 90% of the quality.